When using Safari [in Sierra], it suddenly enlarges the document, similar to what can be done with Control and mouse movement back and forth. If I revert to the previous screen, it returns to correct size, and I can click on the forward button, and it’s fine. My suspicion is that Jeffrey has accidentally triggered a zoom option I just learned existed. With a trackpad or Magic Mouse, macOS offers an option to zoom on selected areas, just as you can in iOS. A subtle setting can result in surprising zooms. In the Trackpad or Mouse system preference pane, click the Scroll & Zoom tab, and then you can opt to check or uncheck Smart Zoom. Now, when you double-tap with two fingers, Safari and other apps will zoom the item tapped upon to fill the screen. Two-finger double-tap again, and it zooms back out to the normal view. In my testing, this zoom remains preserved when you go back a page and back forward. But it’s the most likely answer. Apple also offers a systemwide zoom in the Accessibility preference pane, as Jeffrey alludes to. 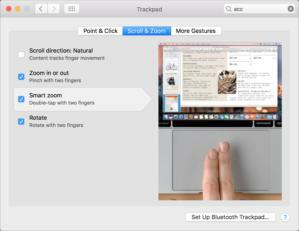 Open the pane, select Zoom, and you can opt to enable or disable the Use Scroll Gesture with Modifier Keys to Zoom. The Control key is the default modifier.